Other Physical Attributes: Small scar over right eye, prominent nose. 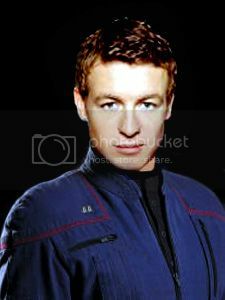 Enlisted in Starfleet at 19 and served on two starships, the freighters Karandan and Enderay as communications technician, Richard McDonald is the exception of being a prior enlisted Starfleet officer. His family history is extensive in the Starfleet and Earth military ranks, and he is the first officer in his family in over 400 years. His specialization in engineering is unusual in that his mathematics and science background is the weakest of his academic skills. Brute force, determination, and the support of classmates, instructors, and professors led him to take on the very challenges he feared most. This strength of character defines who McDonald is as a person, and serves to portray him as experienced beyond his years.